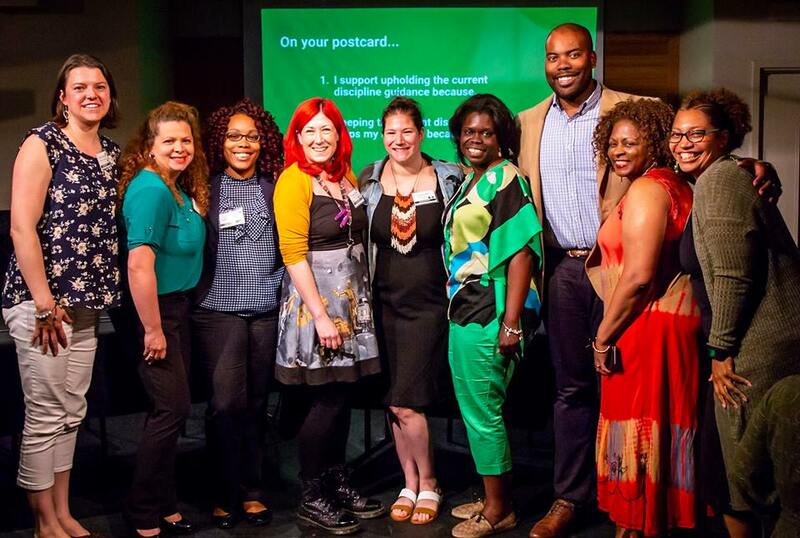 E4E-Chicago hosted “In Class, Not Cuffs: A Chicago Town Hall” on Thursday, June 7 to show support for federal guidance designed to help teachers address discipline without discriminating that U.S. Education Secretary Betsy DeVos may rescind. 90 educators attended and shared their stories with Acting Assistant Secretary of Elementary and Secondary Education Jason Botel and Attorney Advisor for the Office of Civil Rights Brittany Bull about how the restorative practices outlined in the guidance have played an important role in improving student discipline and social-emotional wellbeing. E4E-Chicago members presented Botel and Bull with postcards from teachers requesting that U.S. Secretary of Education Betsy DeVos keep the guidance that helps educators explore effective alternatives to exclusionary discipline practices, such as suspension and expulsion. Check out some of the highlights! E4E-Chicago members spoke to moderator Doug Stalnos from the Chicago Public Schools Office of Social and Emotional Learning on their experiences using restorative practices instead of punitive measures with their students.